I’m making a Forge World order today. If you want to commission a Forge World piece you can get free Express shipping if you piggyback. But you’d better get to me right quick about it. I do FW quotes on an individual basis. I charge a premium for assembly. These models are waaaay harder to put together than most people realize. Things you wouldn’t even imagine. I will usually give three quotes: one for wargamer standard (I think FW figures deserve more love than this), an L4 “extra love” option (recommended), and then higher levels. If you give me an idea of what you’re after that helps. PS- a GREAT way to get an immediate response from me is Google Chat (bluetablepainting). I sometimes don’t notice the permission request (which you need to get initially) so it’s good to send an email concurrent with that. Right now I’m up at 4:44am. I’ve been up for over an hour and a half. I’ve been watching Galaxy Quest. Good thing I left my Magic cards at the studio, I have been able to get pretty much caught up on my webwork, though I do have 30 minutes of Morning Show footage to edit and put up. Now my wife is up with the baby. Two of the older kids are up in our bed. It’s like a little can of sardines up there. Not like that every night. We are watching Eleventh Hour, one of her favorite shows. Baby Willow is healthy and happy. She is a contented burbly little pod. She’s an “easy” baby. Just happy to be along for the ride. Here’s the deal with Friday. Tamie took the kids to the Aquarium up in Salt Lake. She’s a really good Mom that way. The kids get a ton of life experiences. I was at “work” all day. I had a huge load of projects to work through and made good headway. The Thunderhawk project is almost completely assembled now. It was ward temple night. Quite a sublime experience. I’m glad I went. There’s always that resistance just before; to take the easier course. We are slightly underbooked for March. There is still one golden slot open for the 30/30 special (which I am now expanding to include Warriors of Chaos and Vampire Counts). There are six slots left for March overall. If I got all those filled up today I think I would turn a back flip. The studio is like a six-piston engine. Everyone is working harmoniously. The talent on board right now is through the roof– each one dedicated to the craft. I was watching your new video and thought I would share a fun yet disturbing food fact about red food coloring. The next time you get something with red food dye look on the back. If ithas the word “CARMIN” on the back guess what you are eating. This is no joke it is for real. It is a dried red beetle. They dry the beetle then grind it in to a powderthat turns food red. Simulating cherry, strawberry, raspberry, etc. Just thought you might find this interesting.. 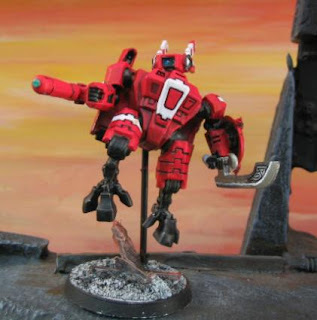 This is a commander from a Tau army in white and red. While the main color of the army is white, this is inverted for the HQ. I think this would be a very handsome color for a Tau army. I took a day off today. A rarity to be sure. I went to my daughter’s school for a presentation she was making, then off with the boys to get our hair cut. So, I’m looking pretty clean-cut. Then various errands and returning home. I am still catching up on my emails. I will be putting in a solid day tomorrow for sure. I have given up on Twitter for the time being. It’s enough that I do this blog update each day. 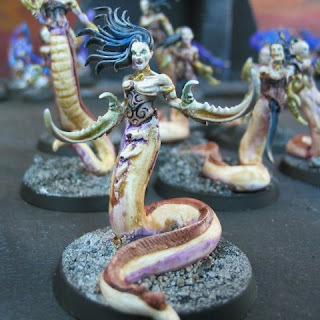 Here is our answer to Seekers of Slaanesh. These have been removed from the GW site. There are rumors that new ones (maybe plastic) are in the works. But no matter how cool those are, I think our snak-ey ones are really cool, and I expect that they will become a BTP classic. Not liking Twitter so much. I feel like I’m beholden to it. Also, it can’t be edited like the blog. I think that is done. Tuesday was insanely busy. I wasn’t able to get around to the various videos I wanted to get edited and polished. I am expecting a wave of projects to come in completed today. I am failing to see how Twitter is better than just the Facebook “what are you doing now” thing, so I’m going with that for the time being. I’m keeping things updated on Twitter. I don’t know if this is going to work out long term, but I plan on updating studio everyday items on Twitter. I’d love to hear some feedback after the first week trial run. I don’t see how this is better than facebook. I got up around 7am and spent at least three hours without anyone else getting out of bed. It was calm and quiet. Sausage and eggs and cheese for breakfast. My wife is using a local farm co-op to get some amazing food, a whole box of it for cheap. 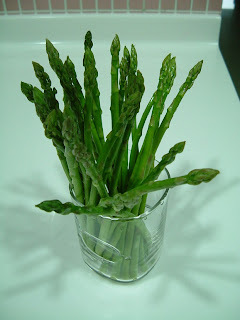 She got a few bundles of asparagus. That’s good stuff and brings back a lot of good memories of Oregon. It grows wild in the orchards there and we would go out as a family on the weekends to pick it. I visited my home teaching families today, which is always an uplifting experience. It’s great to get interwoven with others lives, to strengthen the community. Then off to church. Just the older kids today. Tamie is still staying home with the baby, to reduce exposure to various bugs. We had a substitute Sunday School teacher. She was really something else, so engaging and down to earth. As usual I have a lot of things on my mind, but I’m afraid it’s creeping up on 11pm and I’m just going to call it a night. I have a hard time expressing religious/spiritual ideas because all the words I might use are already loaded with pre-conceptions. Is there a downside to life? Not really. I’m grateful. The kids are a joy. Exasperating sometimes, but toootally worth it. I am very excited to get back to work tomorrow. I have the regular giant pile of emails that has accumulated over the weekend. But don’t get me wrong. I love it.